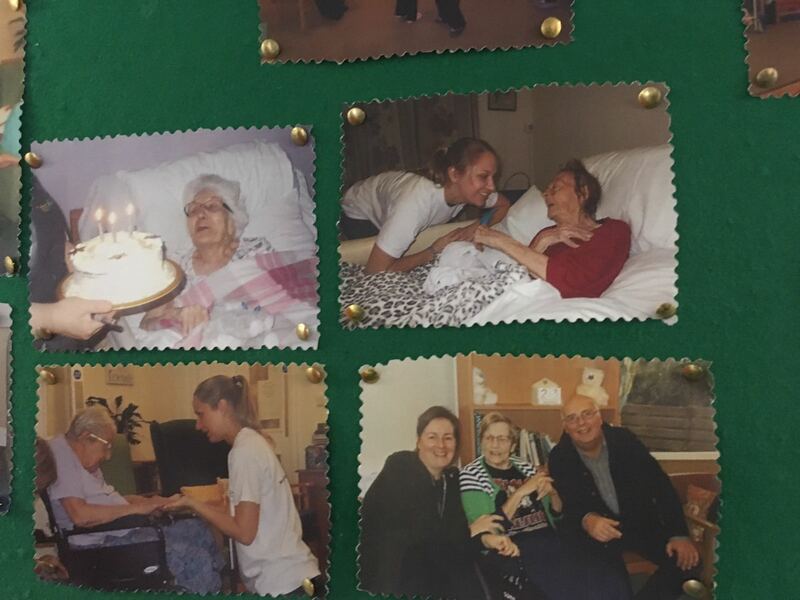 It’s always great to hear the good things said about our classes, but it’s even better to find out that a care home is so pleased with them they’re sharing photos of the sessions with residents, family and friends. This is what happened at Mayflower Care Home where Steph, Rebecca and Georgie have been delivering Active Armchairs, Circle Dance and Active Armchairs One to One. The photos below were found on the wall, but there are also some in the home’s brochure! Active Armchairs in the main room. Steph is dancing with a resident as other watch. This is a great chance for the facilitator to get to know individuals! Active Armchairs One to One means that everyone has the chance to dance and interact with our facilitators. Here Steph has been invited to a resident’s room and works with an individual in one of the living areas as well. Such a rewarding time. Some more photos of One to One Active Armchairs sessions with Steph. This time there are some family members and friends present. Everyone is welcome to join in if they want to. 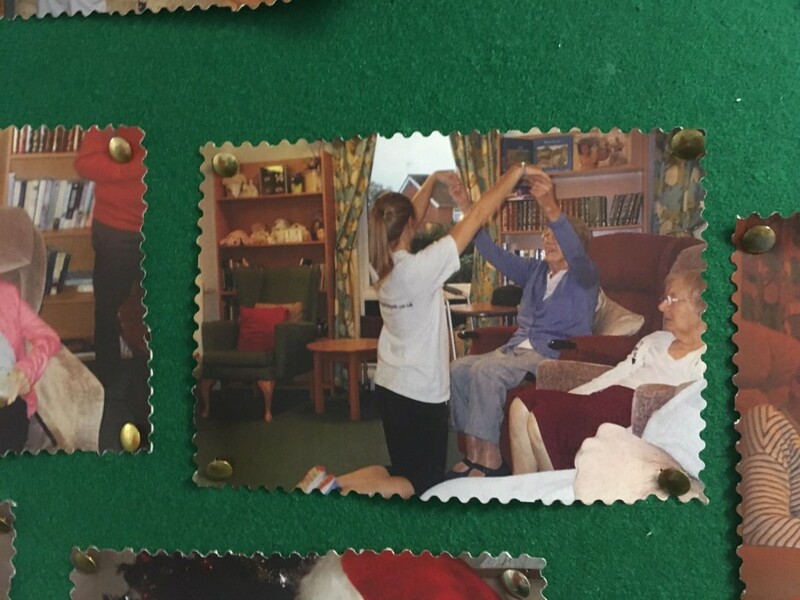 There’s also a photo of some local school children doing cheerleading with residents. It’s great to see them dancing even when we aren’t there! 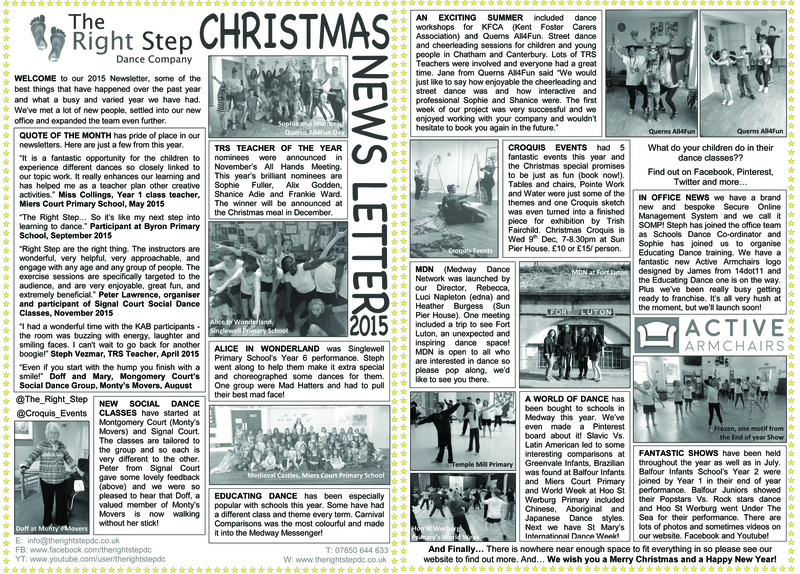 It’s really nice to have so many things happening each week. 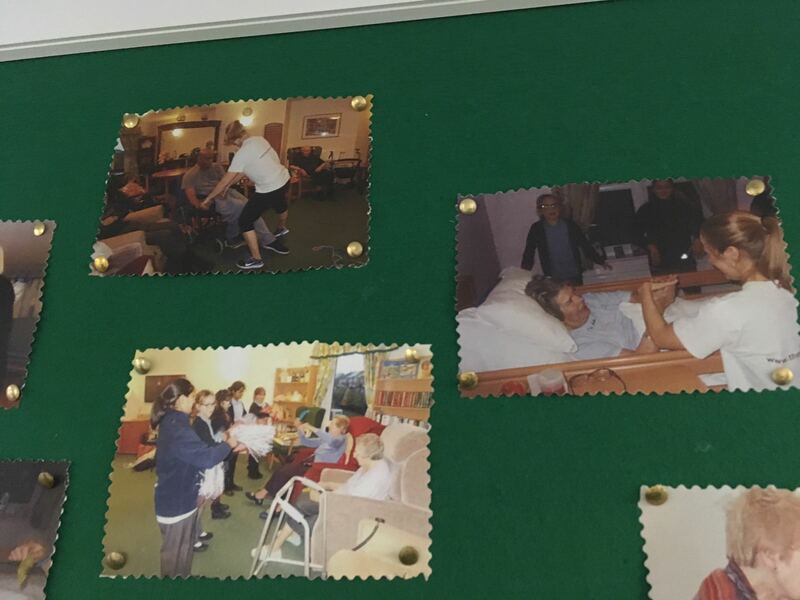 We can build excellent relationships with the residents, staff and family members (some of whom regularly attend) and can tailor the sessions really well. We’re all looking forward to the sessions continuing for a long time. Two schools are ending the term with a big, World Dance, bang. 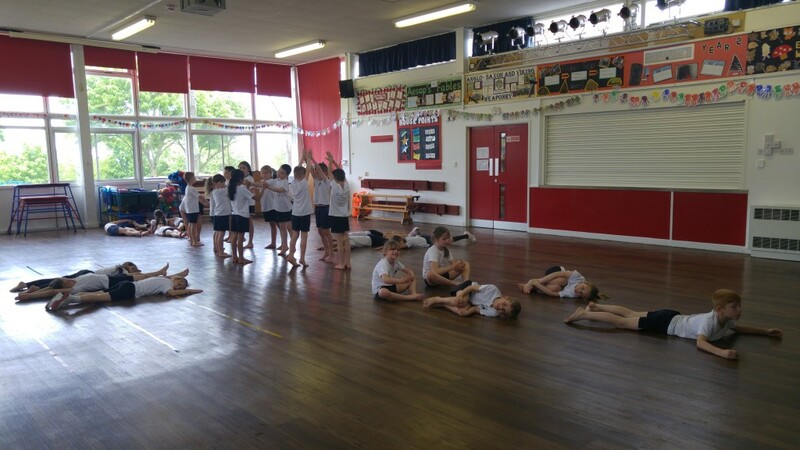 St Mary’s Primary School and Hoo St Werburg Primary have both organised a whole week of dance workshops that represent the diverse and exciting world of dance. The first week of workshops was held at St Mary’s Primary School where Steph, Karen, Gemma and Sophie all went in to lead workshops. Every pupil had a go! Reception used the book, Tydilik, and a video about a cockatoo to learn about Aboriginal Dance. 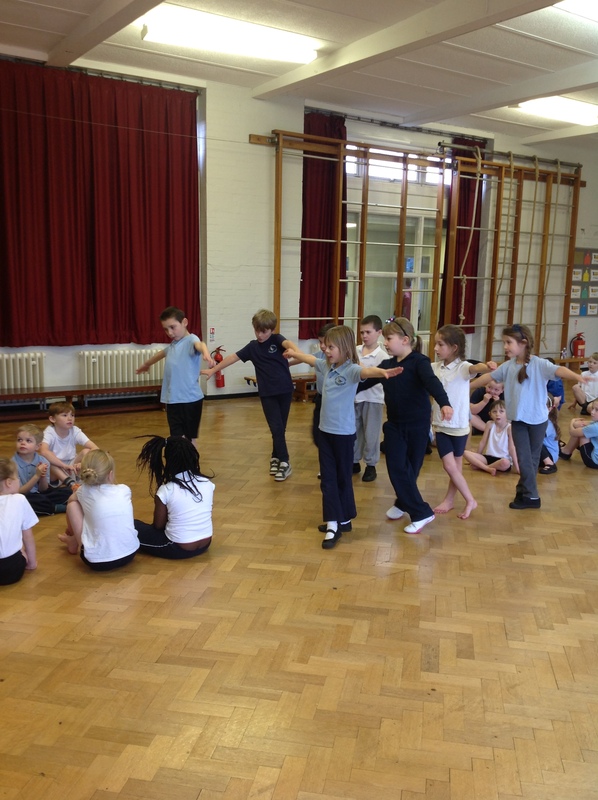 Year 1 had a workshop about Aliens, not quite of our world, but if they’re there we’re sure they’re dancing somewhere! 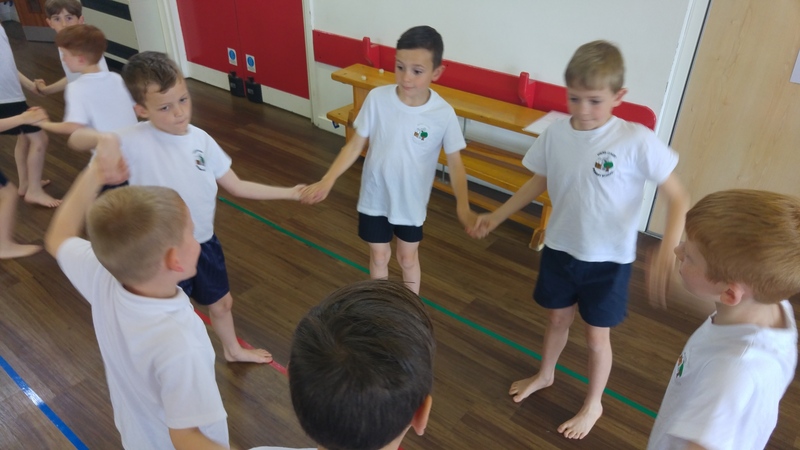 Year 2’s topic is Britain so Sophie taught them Country Dancing, she said ‘I had an enjoyable day at St Mary’s, staff and children made me feel very welcome. I first had country dancing with year 2 and both classes were focused and got their head around the fancy formations and changing partners! I split the class half and half for everybody to have a chance to perform and watch. Comments from the audience included ‘how we stand in little groups looks good’, ‘I noticed we made a cross with our arms when we went round’. When asked what their favourite part of the dance was one girl said ‘I liked changing partners’. 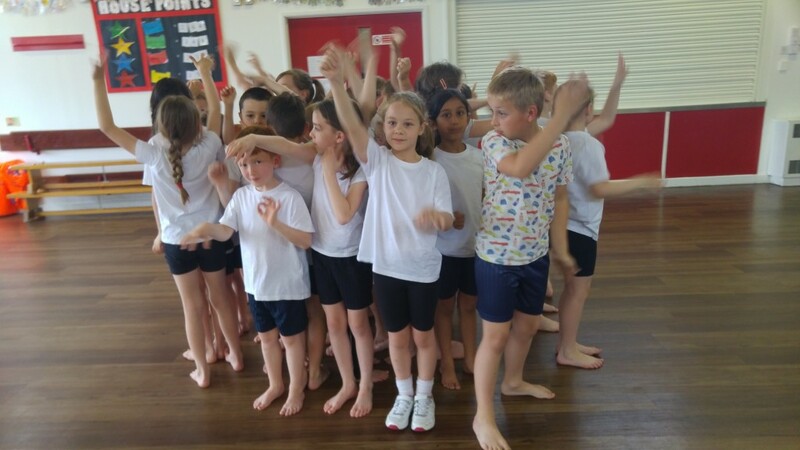 Year 3 had a Rock ‘n’ Roll workshop with a twist, it linked to their topic, The Rainforest so they ended up with a fantastic Rainforest Rock ‘n’ Roll Party! Year 4 brought in their wellies and did Gumboot dancing, a very loud African dance style. 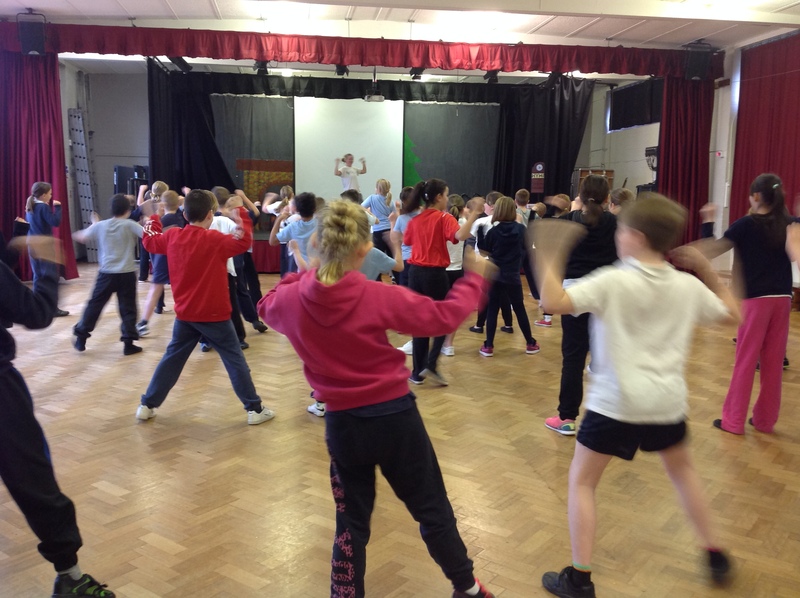 Year 5 had a South American themed Samba Dance lesson and last, but not least, Year 6 did STOMP, full of rhythms and sounds, this was a very loud session too! The TRS Teachers, School Teachers and Pupils all decided who they thought had worked hardest at their dances. These small groups performed in a celebration assembly at the end of the week. 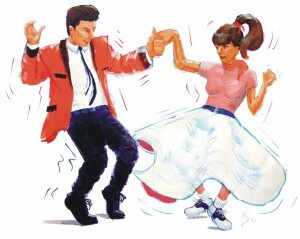 “Dancing was great, I tried to pop in on most sessions. Everything went well and all seemed to run to plan. I’d be more than happy to run something similar next year, finances permitting. 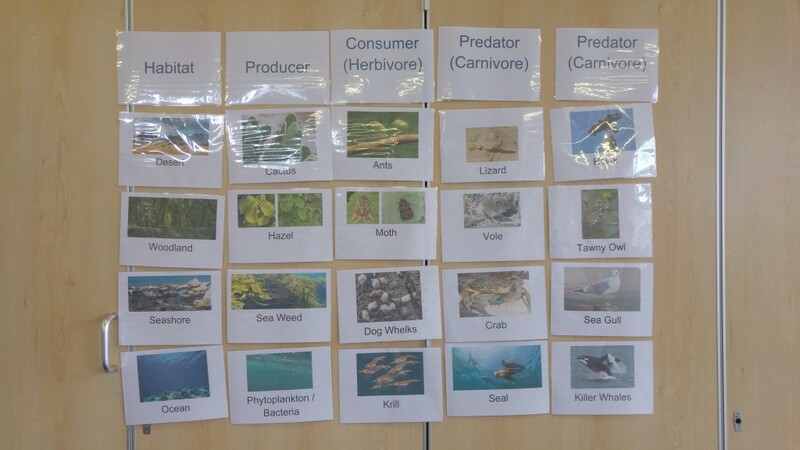 Following the fantastic week at St Mary’s Primary, some more TRS Teachers went to Hoo St Werburg Primary School. Foundation Stage had a theme that we’d not done before, China. Year 1 did Country Dancing and Year 2 had South American dance, both with Gemma. Over the week Year 3 did Australian, Aboriginal style, dances with Steph and Clare (see the photo on the right), Year 4 danced The Charleston, Year 5 The Samba and Year 6 had Butoh, a Japanese dance style. 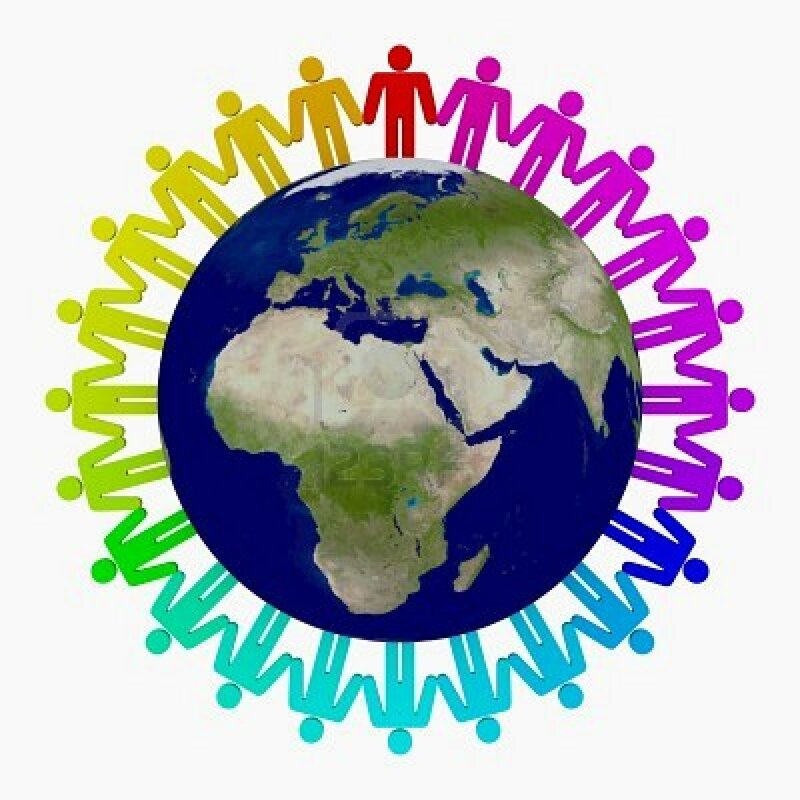 At the end of the week there will be a performance assembly to celebrate all the dances that have been learnt! More about what we offer schools can be found HERE. 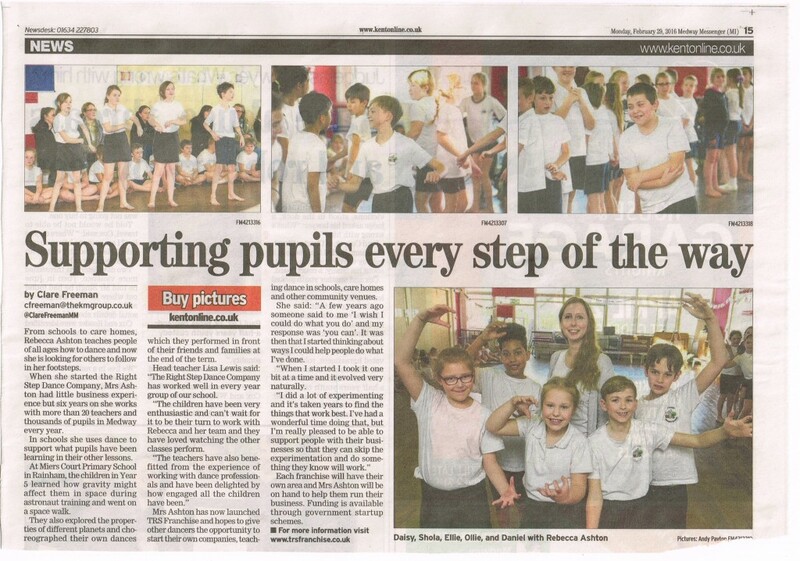 We are happy to help schools timetable events such as these world dance weeks. We take the stress out of making sure each class has the opportunity to take part and we make sure that each class has the most suitable dance teacher for the style or topic they’ve asked for.